This lease is designed for the urban high rise retail mall. It is pro-landlord in tone, and the minimum rent and percentage rent are specified in the captions page where the business deal is specified. The lease contains a continuous operations clause, which is common for retail percentage rent leases. THIS LEASE is made and entered into this ______ day of ________ 20__, by and between _________________________ (herein called “Landlord”), and _____________________ (herein called “Tenant”). 2.1 The Premises are leased for a term (herein called the “Term”) which shall commence the number of days specified in the Basic Lease Information after Landlord has delivered the Premises to Tenant in accordance with Section 4.2 hereof or on the date Tenant shall open the Premises for business, whichever is the first to occur; and, unless sooner terminated as hereinafter provided, shall continue until the expiration date specified in the Basic Lease Information. The dates upon which the Term shall commence and terminate pursuant to this Article 2 are herein called the “Commencement Date” and the “Expiration Date,” respectively. Landlord shall use its best efforts to deliver possession of the Premises to Tenant on or before the scheduled delivery date specified in the Basic Lease Information; provided, however, if Landlord for any reason cannot deliver possession of the Premises by such date, this Lease shall not be void or voidable nor shall Landlord be liable to Tenant for any damage resulting therefrom. Notwithstanding the foregoing, in the event Landlord has not delivered possession of the Premises to Tenant within _________ (____) years from the date of this Lease, then either Landlord or Tenant, at their option, at any time thereafter but prior to delivery of possession of the Premises to Tenant, may terminate this Lease by notice to the other, and both parties shall thereupon be released from all obligations hereunder. 2.2 In the event Tenant shall fail to open the Premises for business to the general public upon the Commencement Date, then in order to compensate Landlord for its loss, Tenant shall pay to Landlord as additional rental over and above the fixed minimum rental and other charges to be paid by Tenant to Landlord pursuant to this Lease a sum equal to the amount set forth in the Basic Lease Information for each full calendar month after the Commencement Date that Tenant shall have failed to open the Premises for business; periods of less than one month shall be prorated. This remedy shall be in addition to any and all other remedies provided in this Lease to Landlord in the event of default by Tenant. Such additional rent shall be deemed to be in lieu of any percentage rent that might have been earned during the period of Tenant’s failure to open. 3.1 Tenant shall pay to Landlord during the Term the fixed minimum annual rental specified in the Basic Lease Information, which sum shall be payable by Tenant in equal consecutive monthly install­ments on or before the first day of each month, in advance, at the address specified for Landlord in the Basic Lease Information, or such other place as Landlord shall designate, without any prior demand therefor and without any deductions or setoff whatsoever. If the Commencement Date should occur on a day other than the first day of a calendar month, or the Expiration Date should occur on a day other than the last day of a calendar month, then the rental for such fractional month shall be prorated upon a daily basis based upon a thirty (30) day calendar month. 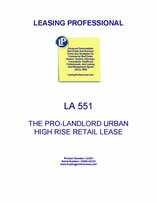 3.2 (a) In addition to the payment of the fixed minimum annual rental as hereinbefore provided, Tenant shall pay to Landlord during each lease year, as hereinafter defined, of the Term the amount by which the percentage specified in the Basic Lease Information of all gross sales resulting from business conducted in, on or from the Premises during such lease year exceeds the minimum annual rental paid by Tenant for such lease year. The annual percentage rental shall be payable at the times and in the manner hereinafter set forth, at the address specified for Landlord in the Basic Lease Information, or such other place as Landlord shall designate, without any prior demand therefor and without any deductions or setoff whatsoever. (b) The annual percentage rental shall be paid in quarter-annual installments computed on all gross sales during each quarter-annual period of the Term in excess of one-quarter (1/4) of the minimum annual rental paid by Tenant for such period. Such quarter-annual installments shall be payable within thirty (30) days after the expiration of each three (3) month period of each lease year. In the event that the total of the quarter-annual installments of percentage rental for any lease year does not equal the annual percentage rental computed on the total amount of gross sales for such lease year, in accordance with the formula set forth above, then Tenant, at the time it submits the annual statement of gross sales required under Section 3.5 hereof, shall pay Landlord any deficiency, or Landlord shall credit any over-payment to the next installment of percentage rental due from Tenant, as the case may be. In no event, however, shall the rental to be paid by Tenant and retained by Landlord for any lease year be less than the fixed minimum annual rental hereinbefore specified. If the Commencement Date is other than February 1st, then the percentage rental covering a partial lease year, as hereinafter defined, shall be paid on gross sales in excess of minimum gross sales computed on a pro rata basis for the period beginning on the Commencement Date and ending on the succeeding January 31st, and shall be payable within thirty (30) days thereafter. 3.3 The term “gross sales” as used herein shall be construed to include the entire amount of the actual sales price, whether for cash or otherwise, of all sales of merchandise and services and all other receipts whatsoever of all business conducted in or from the Premises, including mail or telephone orders received or filled at the Premises and including all deposits not refunded to purchasers, orders taken although such orders may be filled elsewhere, and including sales by any sublessee, concessionaire or licensee or otherwise in or from the Premises. No deduction shall be allowed for uncollected or uncollectable credit accounts. Such term shall not include, however, any sums collected by Tenant and paid out by Tenant for any sales or excise tax imposed by any duly constituted governmental authority nor shall it include the exchange of merchandise between the stores of Tenant, if any, where such exchange of goods or merchandise is made solely for the convenient operation of the business of Tenant and not for the purpose of consummating a sale which has theretofore been made in or from the Premises and/or for the purpose of depriving Landlord of the benefit of a sale which otherwise would be made in or from the Premises, nor shall the term include the amount of returns to shippers or manufacturers nor proceeds from the sale of used trade fixtures. There shall be deductible from gross sales the amount of any cash or credit refund made upon any sale in or from the Premises where the merchandise sold, or some part thereof, is thereafter returned by the purchaser and accepted by Tenant.